There will be a cosplay competition that will be held within the Powerplant Mall, Rockwell, Makati City. June 27, 2008. So block off this date on your calendars! 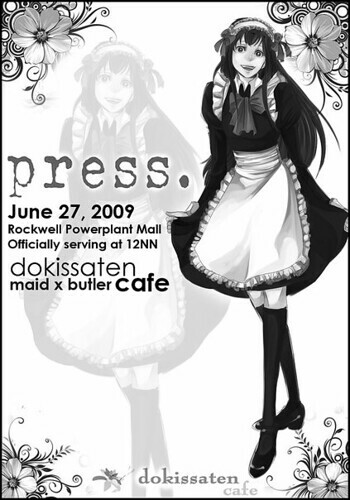 Dokissaten Maid & Butler Cafe in partner with FullyBooked’s PressCafe will also be there! + prizes from sponsors: Powerplant, Maxicollector, etc. Limited to 40 pre-registered cosplay contest participants. So watch out for the reg forms. Also, the Dokissaten Cafe (formerly known as the Doki Doki Kissaten Cafe) will be partnering with Fully Booked to give you another experience to join the cafe. The cafe has been present at Kourtyard Caffe (along Katipunan Ave. – last March), at the Shizen Orchestra convention (at SMX last April) and will now be at Powerplant. With new additions to the cast, a wider variety of butlers and maids, there’s a lot more to look forward to.